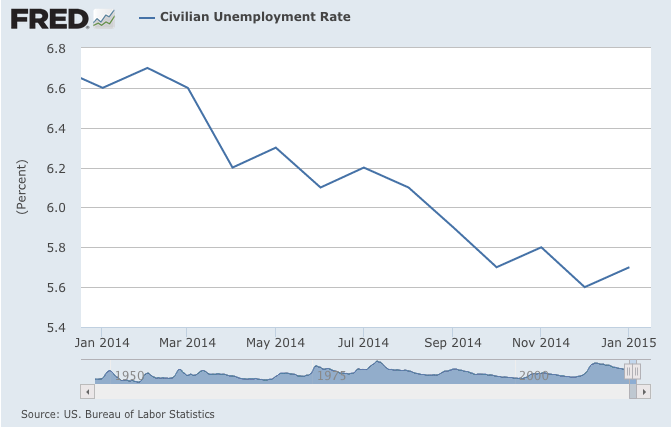 The Bureau of Labor Statistics released their January 2015 jobs report that showed the economy grew by 257,000 jobs and the unemployment rate had a modest increase at 5.7 percent. This is a good sign because January and February are typically slow hiring months with weather being a factor. Over the last six months, we have gained at least 250,000 jobs or more in four of those months with an average job growth of 282,000. Here is why the figure of 282,000 is significant. If we can maintain this pace over the next two years, then we can close the jobs gap originating from the Great Recession before 2017. 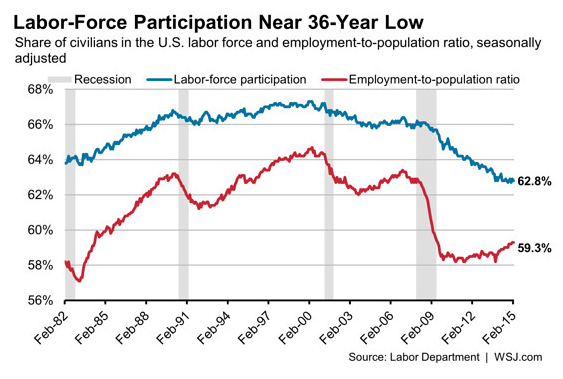 Even though we have recovered all of the jobs lost from the Great Recession, a gap remains because there were not enough jobs created to account for the growth in the labor force. When consumers feel that low gas prices will be permanent, we feel ‘richer’ and that will show in our spending habits. 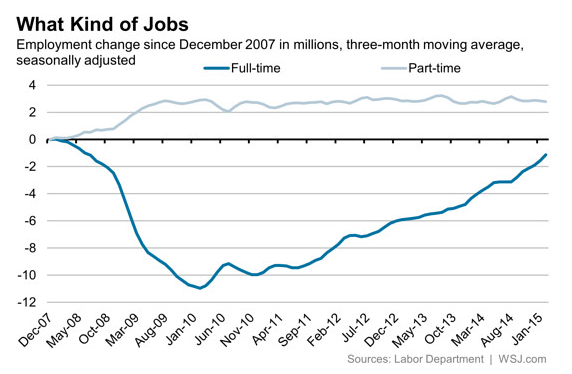 As a result, we have seen retail trade employment grow by 46,000. 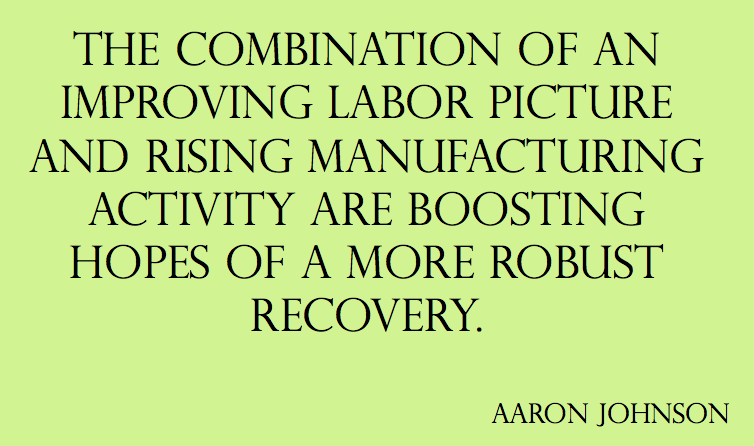 Other industries enjoying gains include health care, financial services, and manufacturing. Another encouraging sign is in construction. 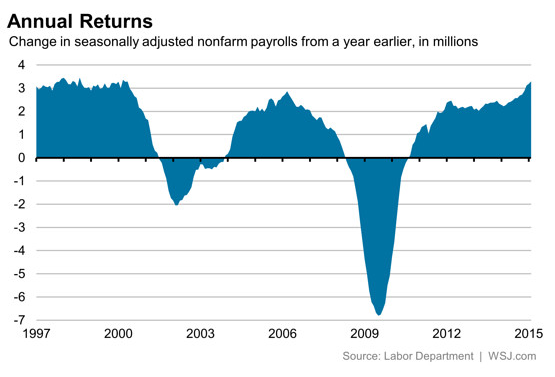 Despite January typically being a slow month due to weather, there was a gain of 39,000 jobs. This figure exceeds monthly average of 28,000, thus suggesting that the housing market and business activity might see gains in the future. 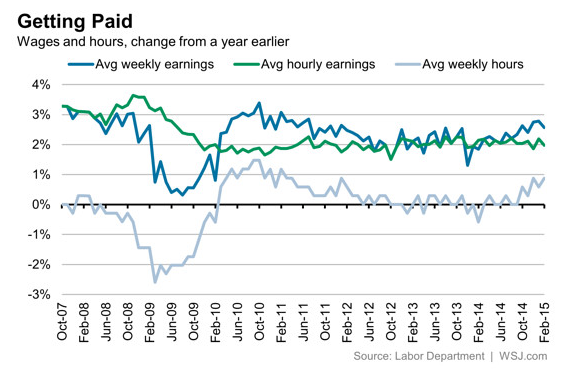 Previously, we have seen job gains, but wages have been stagnant. Hopefully, that trend will begin to reverse, which we have seen in January with average hourly wages increasing by 25 cents. Even though the Fed will closely monitor wage growth for concern of inflation, Americans will be gratified to see their pay increase in the future. 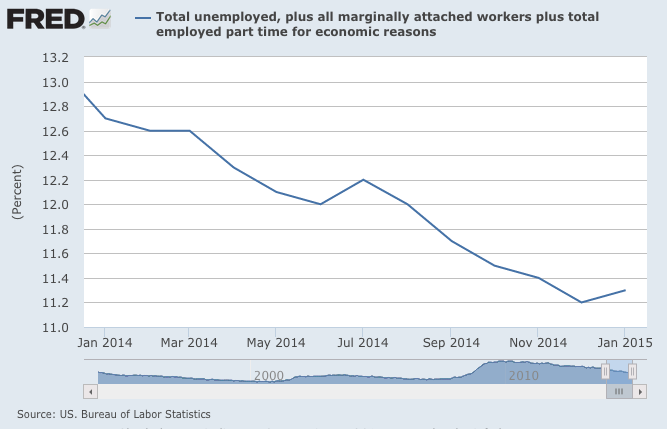 Here are three graphs courtesy of the St. Louis Fed’s FRED research website that show how much the labor market has improved over the last year. 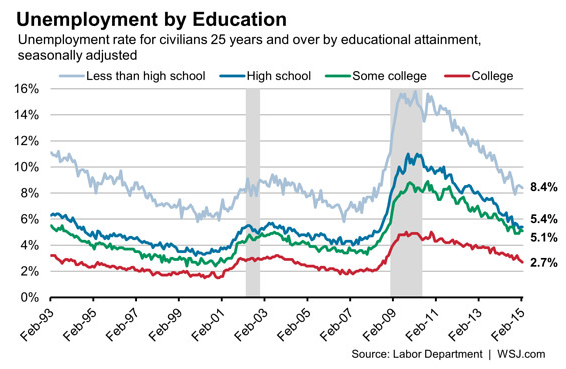 Civilian unemployment rate is steadily falling. 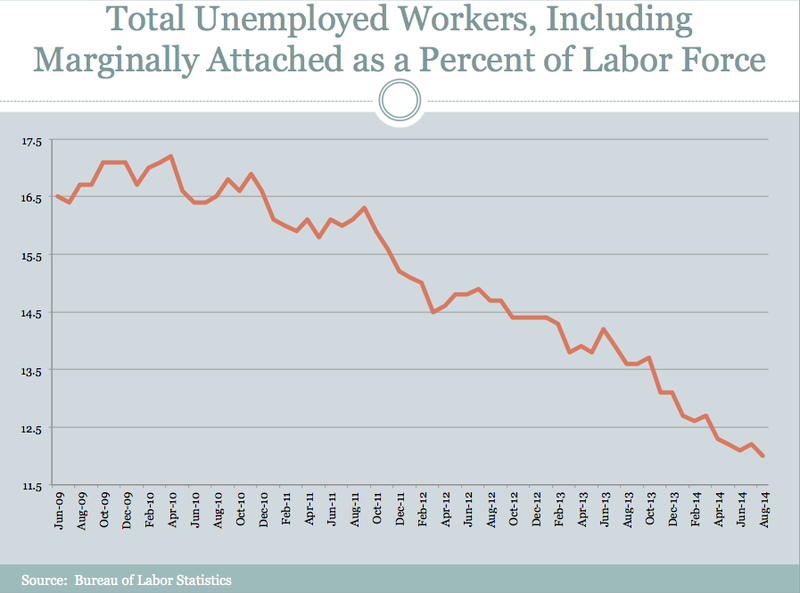 The alternative measure of unemployment (U-6) rate that attempts to measure discouraged workers and underemployed workers continue to fall. 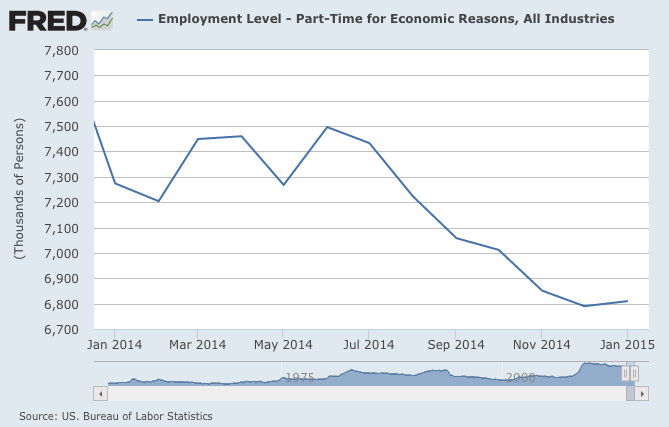 Part-time employment for economic reasons is also falling. We are off to an encouraging start in January, so let’s hope the momentum continues through the year. 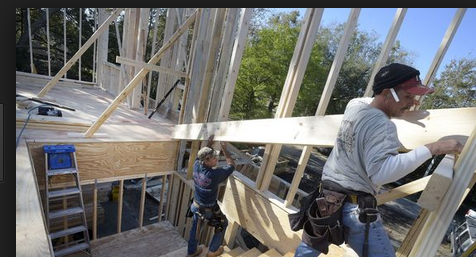 The U.S. Bureau of Economic Analysis released its preliminary estimate of 4th quarter results and it shows that economic growth slowed considerably from last quarter’s torrid pace of 5 percent to 2.4 percent. This estimate should be viewed with caution because it is based on incomplete data and further revisions will be released in the future. Having said that, it still remains a decent figure and is more in line with what we experienced throughout the year. If this quarter’s growth were to receive a grade, it would be C+ without a curve, but an A with a curve. Consumer spending picked up, which can be explained by low gas prices that freed up more money to spend in other areas. Business spending also grew, particular in intellectual property and residential. A weakening global economy and resurgent U.S. economy drove down net exports. Federal government spending contracted by the largest margin of the year. The pace of equipment spending dropped and overall growth in fixed investment and structures grew at a slower rate. Overall, we should still be encouraged by these numbers. Even though U.S. retail sales in December were down slightly from November, the U.S. economy continues to gain momentum. While some are suggesting that this represents a chink in the armor in the reemergence of the U.S. economy, this is likely a temporary setback and one should fully expect our U.S. retail sales to continue its resurgence through the first quarter. Low gas prices should continue for the foreseeable future. Consumer confidence will continue to rise as they start to believe low gas prices are permanent. While energy and commodity sectors will struggle, the expected rise in consumer spending should offset those declines. As consumers believe low gas prices will be more permanent, they will loosen their wallets more in the future. Energy and commodities sectors will take a hit and possibly affect banking and access to credit. Countries outside the U.S. are experiencing economic decline, which will impact U.S. exporters. U.S. economic activity is strongly weighted toward consumer spending with it representing approximately 70 percent of all economic activity. Lower energy and commodity costs will make it more attractive for retailers to expand operations and create jobs. Despite these potential threats, the strength of the U.S. consumer should lead the U.S. retail sales to rebound at a healthy rate in the first quarter of 2015. Diana A. Cooke and Wiliam T. Gavin of the St. Louis Fed’s Regional Economist do an excellent job in explaining the role of Fed credibility on inflation. Inflation is the rise in overall prices and its measure is critical in determining the overall health of an economy. Even though some inflation is actually healthy, high rates of inflation erodes wealth and causes investor and consumer uncertainty. Also, deflation can be even more damaging as businesses struggle to make ends meet due to an inability to raise prices. That is why investors and the business community values any insight on predicting future inflationary trends. There is historical relevance of Fed credibility and the trend of inflation. The Fed is represented by the Federal Open Market Committee that sets interest rates through conventional means, such as open market operations, discount rate, and reserve requirement, and non-traditional methods, such as quantitative easing, referred to as large scale asset purchases by Bernanke. If you want to learn more both methods, view this lecture from former Fed Chairman Ben Bernanke. Specifically, look at the video between 8:40 to 12:40 where Bernanke discusses the Fed’s conventional methods in controlling monetary policy. From 12:41 to 19:09, he talks about non-conventional methods. 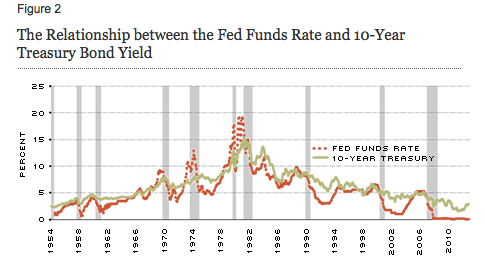 Notice how the Fed Funds Rate which is shown in red was driven down around the mid-1970s. During that period, inflation was very high. It was not until late 70s and early 80s where we see the Fed Funds Rate raised in order to fight inflation. 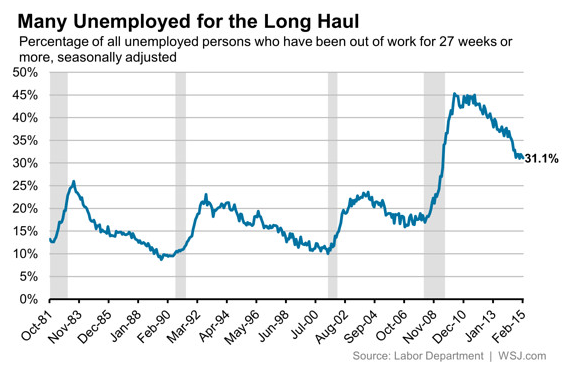 This move eventually killed high inflation, but it came at a cost of higher unemployment and two recessions. It was during this period, described as 1980-1986, where the Fed regained its credibility and that was a main contributor to falling prices. This credibility held true for the next twenty years (1987-2007) where inflation remained modest. However with the onset of highly irregular monetary policy, the Fed pursued drastic measures to stabilize an economy on the brink of collapse due to deteriorating financial institutions that were penalized for its poor lending practices. Even though the Fed’s efforts during this recent crisis was more extensive than the 1970s and one would expect Fed credibility in managing inflation to diminish, we still have not seen a rise inflation. While this is puzzling, Cooke and Gavin believe we can look to the Fisher Effect to understand why inflation has been so sluggish. Now knowing what we learned above, Cooke and Gavin describes three possible scenarios that will all be driven by the Fed’s credibility with investors. Scenario 1: Investors lose credibility and believe inflation will rise significantly. That would lead to a similar environment of the 1970s where stagflation was the norm. This is certainly a scenario that we want to avoid. Scenario 2: Investors still believe the Fed is credible and inflation remains around 2 percent. This scenario will allow the Fed to gradual raise interest rates without threatening a recovery. An increase in nominal interest rates will allow for the real interest rate to rise above zero. This is the best-case scenario. 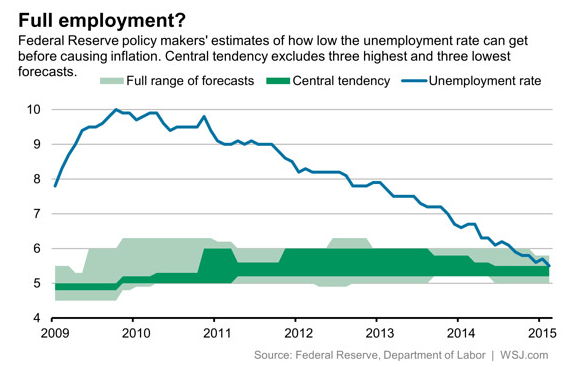 Scenario 3: The Fed continues to keep interest rates low in an environment where the economy remains sluggish. In this case, nominal interest rates remain near zero and the real interest rate stays negative. This will cause investors to believe future inflation will fall. This is the worst-case scenario because deflation is tougher to reverse than inflation. With businesses forced to lower prices, that will lead to cuts in business spending and result in job losses. Given the uncertainty caused by turmoil in the Middle East and Eastern Europe, do not be surprised if deflation becomes our biggest threat to a more robust recovery. Regardless, investors and their take on Fed credibility will be essential to determining our economic fate. 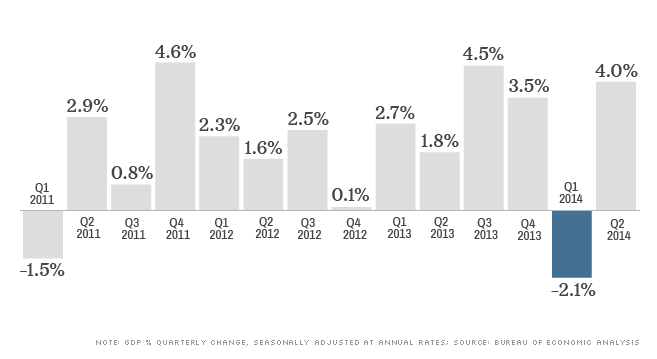 The U.S. Bureau of Economic Analysis released 2nd quarter data and it showed better than expected results. While many expected a significant improvement from the dismal 1st quarter, a growth of 4 percent in real GDP was larger than expected. 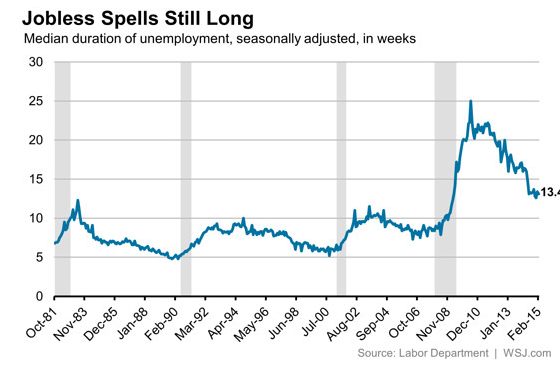 Given their propensity to revise economic data at later dates, we should be cautious in relying on it. For instance, they again revised the economic contraction of last month from 2.9 percent to 2.1 percent. 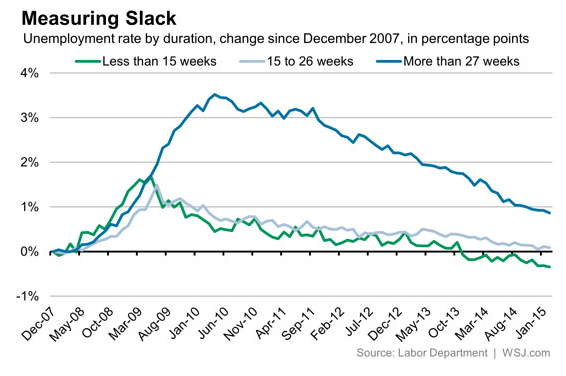 However, this is certainly evidence that the economy has rebounded from a terrible first quarter. Some of this rise can be attributed to severe weather in the previous quarter where consumers stayed in, but started to make up for lost time by resuming their spending habits. This explained the healthy boost of 2.5 percent between April and June in consumer spending. Business investment was also healthy. Gross private investment rose by 17 percent with most of the rise occurring with equipment. This is a significant improvement over the last quarter where investment declined by 6.9 percent. These figures are volatile, but we can take comfort that investment spending has risen in five of the last six quarters. This improvement is consistent with my July 2nd post entitled, “Don’t Worry, Be Cautiously Happy”. 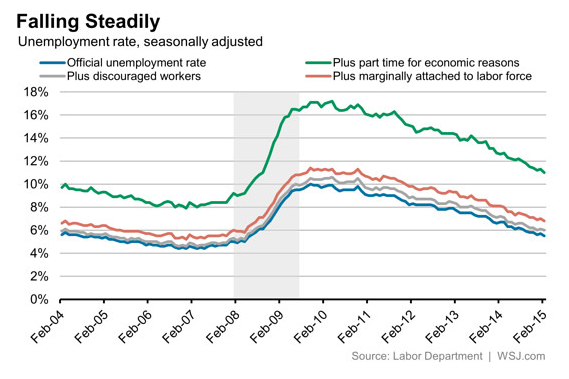 The combination of an improving labor picture and rising manufacturing activity are boosting hopes of a more robust recovery. However, we are not out of the woods yet and should be concerned with the various world crises that can hamper U.S. economic growth in the future.